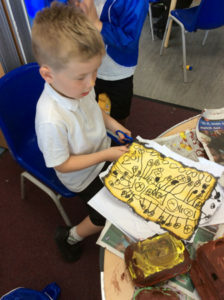 Activity 5 – designing their own pirate flag. Activity 5– Sharing feathers between parrots. After lunch the children talked about their outdoor areas and what they like to do during their independent learning time outside. 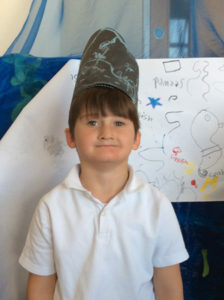 The children were asked to think about what other resources they would like to have outside and they made suggestions such as tennis balls, bats and balls, horses, a fairy house and a trampoline. At the end of the day the children sang some pirate themed songs. 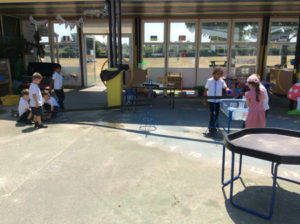 On Friday the children went outside to complete a maths activity. There were 5 large hoops laid out on the floor and the children had to share themselves fairly between the hoops. 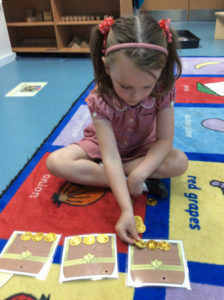 After this the teachers challenged the children to share different amounts of children between different amounts of hoops. 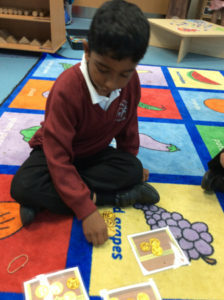 This week the children have shown a developing understanding of the difference between doubling, halving and sharing. 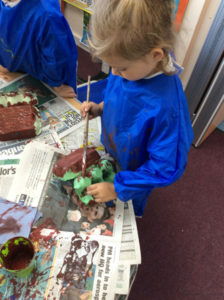 Before lunch the children showcased their treasure chests they had been making throughout the week. 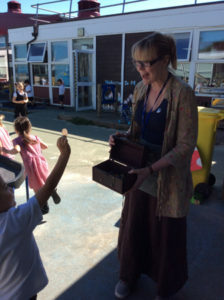 The teachers explained that the children will take their treasure chest home this weekend and that they need to find one special treasure to put in their chest and bring it back to school on Monday. The children were asked to think about which special item they would keep in their treasure chest and shared their ideas with a talk partner. During PE this week the children warmed up by playing ‘stuck, stuck, shark’ (adapted version of stuck in the mud) and then they engaged in team games which included: throwing a bean bag into a hoop; running races; and an obstacle course. During ICT this week the children used the software 2Simple 2Paint a Picture to create a pirate scene, desert island or a treasure map using the pen tools. To end the week the children attended the whole-school celebration assembly. 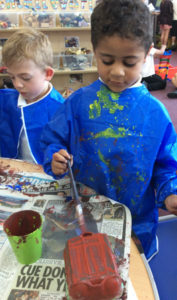 In addition to this the children have been engaging in a variety of pirate themed activities during their independent learning, some of which include: writing about pirates using pirate themed word mats; making scrolls; making maps; sharing sea shells; under the sea role play area; investigating sea shells, starfish and coral at the investigation table; pirates and pirate ship small world exploration outside; making a submarine using crates; boats and playmobil people in the water tray; guttering and metal stands to make a water stream; making a desert island using playdough; and looking at sea themed stories (e.g. The rainbow fish, Sharing a Shell).